Stress costs UK businesses around £6.5 billion every year. But there are simple ways your office design can reduce this. Here are some suggestions. 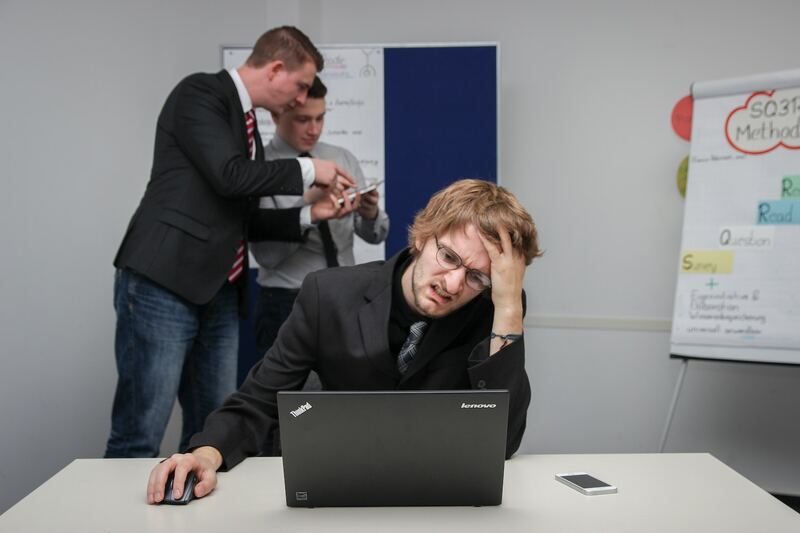 Stress is one of the largest costs to businesses in the UK. According to research, around 10.4 million work days and £6.5 billion are lost every year due to employees being off sick with stress. There is also the hidden cost of poorer productivity and incomplete or low-quality work that is harder to measure. Reducing stress in the office should be a priority for any business and there are numerous ways that your office design can contribute. Here are some of the top ways to factor in stress-reducing elements in your next office design project. Bad posture is linked to several physical and mental illnesses. 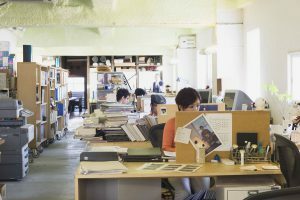 There are several ways to encourage good posture including designing offices that encourage standing work from time to time and ensuring desks and chairs are set up at the optimal height and distance from the user. By encouraging good posture, physical stress on the body is reduced, which in turn can lead to less emotional stress. Some noise is expected in an office setting, but too much noise can produce stress hormones in the body. 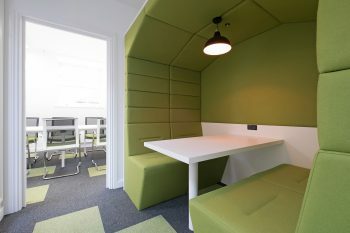 Creating an office environment which reduces noise requires a lot of different elements. Commercial flooring is part of this equation, with carpet tiles being an excellent way of reducing high levels of office noise. Impact sound considers the noise made on one floor to the rooms below. The level of impact sound reduction is often found on flooring specifications sheets. It measures in decibels the difference between a hammer machine being used directly on to a concrete floor and then on the tested floor covering. In-Room Impact Noise is also a consideration, the best performing floor coverings are Class A. 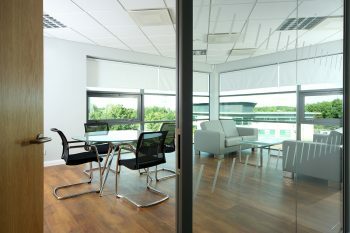 However, where design comes in here is also essential – soft furnishings, partitioning and feature walls all contribute to reducing noise levels. Natural light is an important part of our health. Without natural light, workers can suffer from reduced mental alertness, bad sleeping patterns and poor job performance. Mental health conditions can also cause anxiety, stress and depression. Therefore, you should always seek to increase the amount of natural light able to enter a room. If this isn’t possible, offer your clients the option to turn lights up to full spectrum light or to use artificial daylight bulbs. Nature can be a powerful element in a business’s productivity. It stimulates workers and helps them feel more relaxed and less stressed. There are several ways that you can improve the biophilic elements of an office. Using natural materials like stone and wood within your office design is one way. Another option is to introduce plants through a living feature wall, or even encouraging your clients to bring a pet to the workplace. Pets have been proven to reduce stress and improve creativity within the office. Another key aspect of workplace stress is lack of exercise. Workers who don’t exercise often experience high levels of physical and mental stress. In order to encourage staff to get up from their desks and move around a bit, ensure you factor in the additional space in your layout, perhaps with specific areas for lunchtime yoga or other forms of exercise. Additionally, standing desks are one way to increase the amount of exercise for employees. By factoring in their physical needs, you can help workers to break the monotony of their regular working day. Accommodating activity based workspace is another consideration as that encourage take up of different tasks in different office locations. Thinking carefully about relaxation, bringing an element of fun in the office, including table tennis tables etc. all help staff take breaks and this can be even more important where going for a walk isn’t an option. Incorporating colour in the office is very important. Dull colours like white and beige are known to trigger depressive feelings and stress among female workers. Colours like purple have the same impact on male workers. Using natural colours in your room, like blue and green, are the best colours to help. Stress is a massive problem for employers. However, by incorporating some clever features into your office design, you can help reduce stress and improve productivity for clients and their staff.